Deborah Layton was born in Tooele, Utah and grew up in Berkeley during the turbulent 1960's. She is the youngest of four siblings. After a rebellious two years in Berkeley, she was sent by her parents to a Quaker boarding school in England. Upon her return from England, at just eighteen years old, she joined the Peoples Temple and moved into their campus dormitory in Northern California. It was at this point that her life dramatically changed. 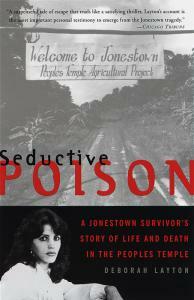 As a trusted aide to Jim Jones, she became embroiled in the upper-level workings of the Peoples Temple, both in California and Guyana. Four weeks after a harrowing narrow escape, Deborah's affidavit became front page news across the country. Six months later and just four days before the tragedy, Deborah was in Washington D.C. giving testimony before State Department officials requesting help for the 900 people held against their will in Jim Jones' encampment in Guyana. Prior to writing Seductive Poison, Layton worked on the trading floor of an investment banking firm in San Francisco. She lives with her family in the Berkeley Hills of California and spends much of her time as an author and public speaker. Seductive Poison has been required reading at major universities around the United States, including: University of California at Davis, Stanford University, Gonzaga University, Rutgers University, Stony Brook University NY, California State University Fresno, plus many others. Seductive Poison is published in Italy, France, Australia, Germany, and United Kingdom.